The food from our BBQ smokers was so delicious, our employees and our customers started asking to order one for their personal use. After much testing and sampling of great meals, we came up with a well-designed smoker. Purl’s Sheet Metal fabricates custom BBQ smokers. Each barbeque smoker body is custom fabricated in our sheet metal shop in Madera, CA. 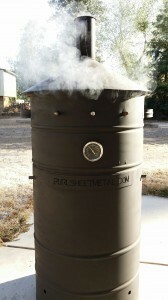 Each smoker contains a top vent, side vents, chrome plated steel cooking grill, meat hanging hooks, removable fire basket, and temperature gauge. It is assembled with care and precision in the USA in Madera, CA. We are proud to announce they are now available for purchase and special order. Options are available for special orders, so give us a call at Purl’s Sheet Metal & Air Conditioning for all the details or even from some great new recipes! Friday barbeques are a tradition at Purl’s Sheet Metal. Our team of employees, customers and invited guests enjoy the weekly Friday lunch at our Madera office. Every week there is something different on the menu. After searching for a BBQ smoker, we decided to fabricate our own. What started as a passion to create the best “smoked” meats for our weekly lunch, quickly turned into a prototype of the new barbeque smoker. The food from our new smoker was so delicious, our employees and our customers started asking to order one for their personal use. After much testing and sampling of great meals, we came up with a well-designed prototype. 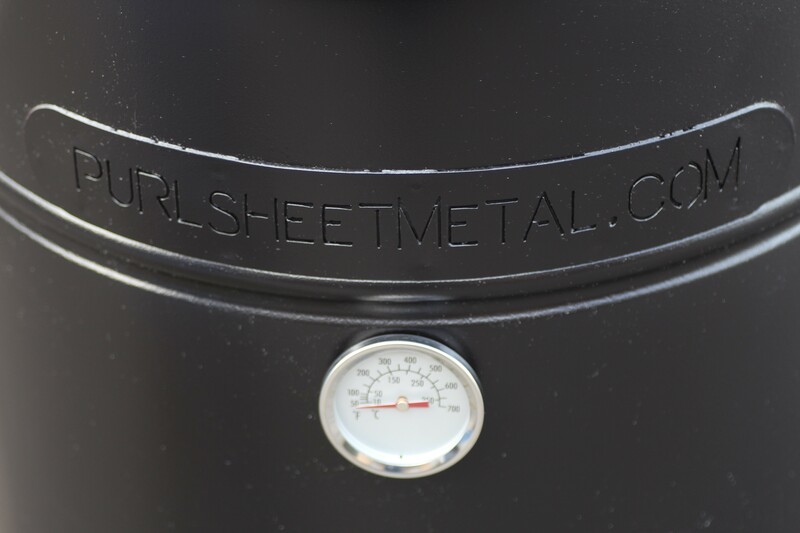 Each barbeque smoker body is custom fabricated in our sheet metal shop in Madera, CA. 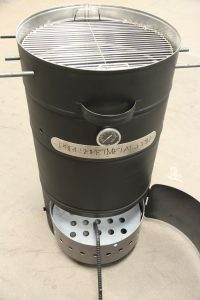 Each smoker contains a top vent, side vents, chrome plated steel cooking grill, meat hanging hooks, removable fire basket, and temperature gauge. It is assembled with care and precision in the USA in Madera, CA. We are proud to announce they are now available for purchase and special order. Options are available for special orders, so give us a call at Purl’s Sheet Metal & Air Conditioning for all the details. The majority of our customers come to us for our quality work installing, repairing, and maintaining air conditioners, heaters, and other indoor comfort systems. 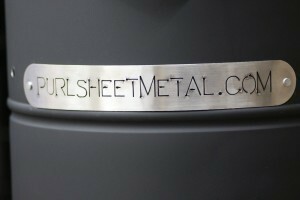 But these customers are often confused at the name of our company and the “sheet metal” part. The truth is that Purl’s Sheet Metal & Air Conditioning started out exclusively in the sheet metal business way back in 1952. This is not completely unheard of in the air conditioning world: developing the sheet metal used for ventilation construction often leads to working with the air conditioners that hook up to them. Sheet metal fabrication is still an important part of our business, and we currently handle the work in a Madera, CA sheet metal fabrication building that covers 24,000 square feet. The technology we use has advanced tremendously since the 1950s, and our cutting-edge computer-controlled tools allow us to produce a high volume of unique products. We handle sheet metal fabrication for different industries and purposes: agricultural products such as irrigation systems and processing ventilation systems; customized roofing to fit any kind of space; hoods for kitchen ranges; and spiral ductwork that has recently gained popularity in both homes and businesses. We also manufacture the sheet metal we use in our new construction installations for heating and air conditioning. One of the key tools in our sheet metal fabrication building is a computer automated plasma cutting table. We can program into the computer the different shapes and sizes of the pieces we need cut for a project. The plasma table then automatically configures them to make the maximum use of the material and cuts the shape using a plasma torch. A plasma torch is device that blasts out an inert gas through a nozzle at high speed and then changes it into plasma with an electric arc; the resulting plasma can move through metal rapidly for smooth cutting. We also use the plasma table to cut out standardized pieces, such as boots, that we use in new construction. If you contact us for installation of a heating system, air conditioning, or ductwork, we will take care of all the necessary fabrication for the job. But you can also contact us when your need customized sheet metal in Madera, CA for a specific project. Our years of experience and up-to-date technology make us one of your best resources for sheet metal fabrication in the Central Valley. Let the flag drop and the dust fly! The Davidson Motorsports team is very close to being ready for the upcoming Battle of Primm Race on February 22 & 23rd in Primm, Nevada. Purl’s Sheet Metal & Air Conditioning is proud to be a sponsor the Davidson Motorsports Racing Team. 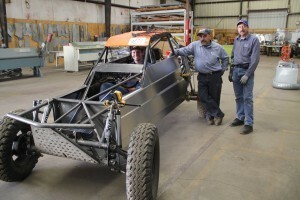 Our Fabrication technicians just completed the custom sheet metal racing skins for the 1820 car. The car is now prepped and ready for paint and stickers. 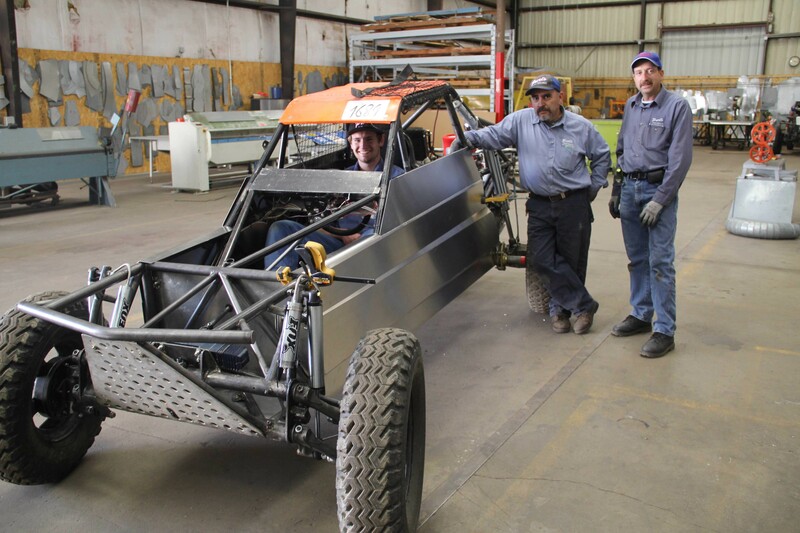 Beans Davidson will be behind the wheel of the 1820 in the upcoming desert race. 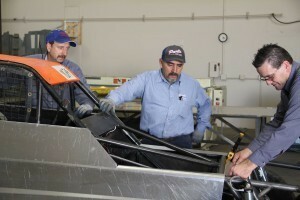 Davidson Motorsports will be fielding 3 cars at the Battle of Primm. 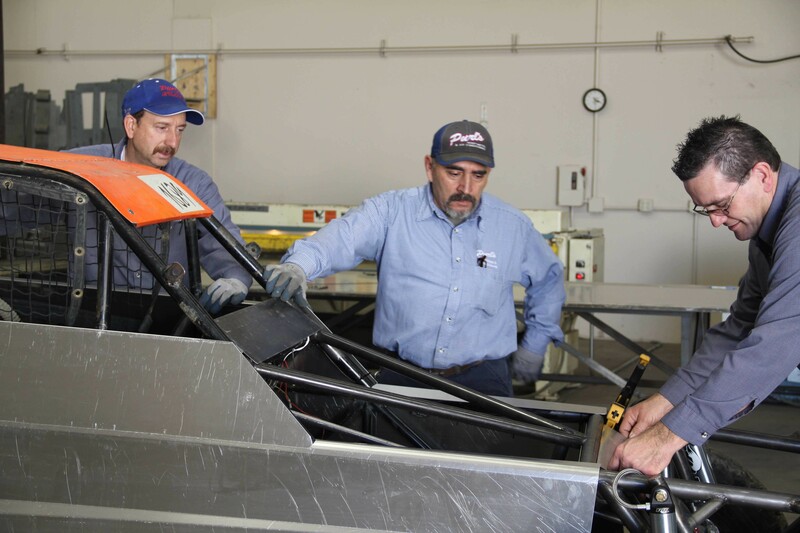 We will post updates on the progress of the cars and the Battle of Primm 2014! Meet Our New Ford Focus Fleet Member! 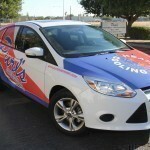 Purl’s Sheet Metal & Air Conditioning is proud to introduce our newest fleet member: the Ford Focus “Speedy”! Our new Ford Focus is fuel efficient and eco-conscious, which suites the Purl’s Sheet Metal philosophy perfectly. We want to do what we can to take care of our environment. Needless to say, we are all very excited about the new addition and wanted to share the news with you! 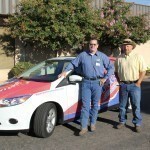 Posted in Air Conditioning, Go Green, Sheet Metal | Comments Off on Meet Our New Ford Focus Fleet Member! Check out this video clip talking about the history of our great company, Purl’s Sheet Metal. We are truly a family here and we love our customers and community just the same! We are honored to have been interviewed as recipients of the Carrier Dealer Hall of Fame Award.